Learn Sight Words with fun sight word sentences and easy to use sight word flash cards. This collection includes the first four lessons in the Sight Word Sentence Series. These lessons are designed to help your little one learn sight words with one simple sentence at a time. Each sentence is written with 100% sight words! 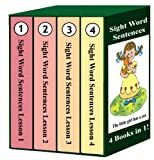 - Sentences: This section is designed to teach your child to recognize sight words in a sentence. Each lesson has 5 sentences that together use the 20 words in the lesson. - Words (alphabetized) - Practice the sight words with flash cards. - Word Flash Cards then Sentences - Read the words in the sentence then read them all together. - Sentences then Word Flash Cards - Read the complete sentence, then read each word one at a time! So what are sight words? : Many of the most frequently used words in English are difficult to sound out and instead, need to be recognized on "sight" for a child to become a proficient reader. Sight words can be known by other names as well including High-frequency words, Dolch words (named after Edward William Dolch, PhD who first compiled the list in 1936), Fry words (named after Dr. Edward B. Fry's who updated the list in 1996), Instant words, Star words and more!